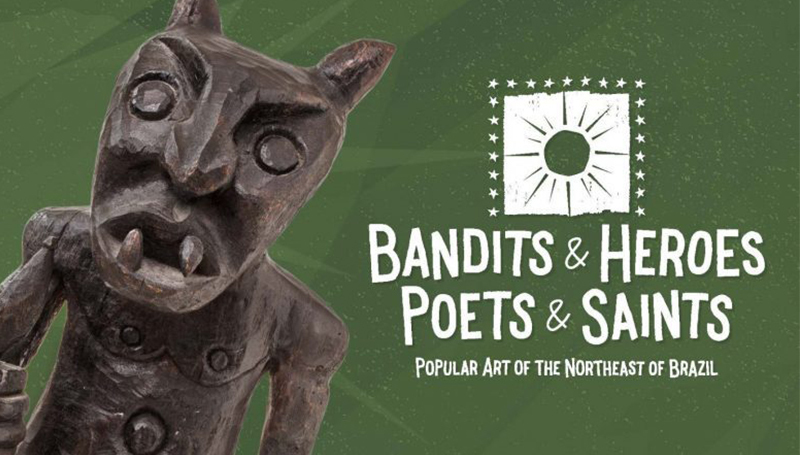 Showcasing how ancient cultures helped create a vibrant cultural mosaic, “Bandits & Heroes, Poets & Saints: Popular Art of the Northeast of Brazil” will open Monday, Jan. 28, in Spiva Art Gallery at Missouri Southern State University. The exhibit, made possible by the National Endowment for the Humanities’ NEH on the Road initiative, will run through March 12. It was brought to Missouri Southern by the Mid-America Arts Alliance and was organized by Con/Vida—Popular Arts of the Americas and the Charles H. Wright Museum of African American History, Detroit, Mich. It includes nearly 200 works of art by more than 50 artists and is comprised of three segments that present the history and culture of Northeast Brazil through popular art. The first is “The Land and its People,” which examines the history of colonial Brazil. The second, “Expressions of Faith,” explores the African-Brazilian religion of Candomble. The third segment is “Poetry, Celebration and Song.” It focuses on folk legends and popular festivals of the Nordestinos (People of the Northeast). Eminent photographers Adenor Gondim and Antonio Neto have helped work on the exhibition, providing photos and video footage showing festivals, ceremonies and pilgrimages. A family “Movie and Maker” event is planned in conjunction with the exhibit. It will be held from 2 to 3:30 p.m. Saturday, Feb. 9. Participants will watch a film on Brazilian art and culture, then create an art object inspired by the show. A reception will be offered from 4 to 6 p.m. Thursday, Feb. 21, with a lecture by renowned scholars of African and Brazilian art and culture set for 6 to 7 p.m. Friday, Feb. 22. Dr. Elizabeth Morton, chair of the Art Department at Wabash College, and Dr. Ivette de Assis Wilson, professor of Spanish and Portuguese at Wabash will share their insight into the themes of the exhibit. Morton will also offer an assessment of Missouri Southern’s African Art Collection. Gallery hours are 9 a.m. to 5 p.m. Monday through Friday. Admission is free and open to the public.